CPM or cost per mille is the amount a website gets from the advertisers for one thousand impressions. To help understand better, if a YouTube channel’s CPM is $2.00 it means that the advertisers will pay $2.00 for every one thousand impressions that the channel receives. 1. CPM is the cost per mille, mille is the Latin word for one thousand. 2. You can increase your YouTube CPM by targeting the audience in countries where CPM is high. 3. The YouTube CPM rates are high in the US. 4. CPM is not the same for all the types of videos. 5. CPM depends on the niche of videos. 6. Average YouTube CPM is $7.6 that means every thousand views might get a revenue of $7.6. 7. All the views on videos are not considered as ad impressions. 8. For a viewer who has an ad-blocking extension then the content, geography and audience demographics play important role in CPM determination. 9. Even when the CPM is more, there is no guarantee that the revenue will also be more. 10. Revenue is calculated by the number of impressions multiplied by CPM divided by one thousand. 11. The actual revenue is affected by the fatlike fill rate and loss. 12. The revenue of a YouTube channel does not depend on the number of subscribers it has. 13. However, high subscriber base will help to increase brand popularity and brings sponsorships. 14. The revenue on a video also does not depend on the number of views. 15. The revenue on the ad is decided based on the interaction of the viewers with the ad. 16. CPM is calculated by revenue divided by one thousand filled impressions. Whereas, fill rate and loss are not taken into consideration. 17. YouTube takes 45% of the money from the YouTuber earns through it. 18. CPM metric is not for the creators of the videos but for the advertisers. 19. CPM for creators is how much money they make for 1000 views. 20. CPM for advertisers is how much they are ready to pay for 1000 views. 21. To increase CPM, the factors of the YouTube channel need to be optimized. 22. Meta data or the title, description, thumbnails and tags of the video are essential to get more views and to increase CPM. 23. Thumbnails also need to be optimized. 24. A different set of ad biddings are preferred depending on YouTubers with different number of subscribers. 25. Increasing watch time helps in deciding search rankings. 26. CPM of YouTube is highest in the month of December. 27. CPM becomes highest during the days of summers and special occasions such as Valentine’s day. 28. YouTubers do not make videos based on the views but they create through the interaction with the ad, clicking or watching the ad for more than thirty seconds. 29. According to information available online, CPM for in-stream videos ads ranges between $1 and $8 per one thousand views. 30. Some videos in the same channel may have more CPM than the others. 31. Some of the tricks to increase YouTube CPM is to provide English subtitles to regional language videos. 32. Increasing video length to a minimum of five minutes etc. 33. The longer the videos, the more interest the advertisers will show. 34. CPM differs across the world based on where the audience for the video comes from. 35. Countries in which English is the native language have better CPM than other countries. 36. CPM per view on TrueView ads is very high. 37. CPM is dropping presently because of increased demand for digital video marketing. 38. The more popular the channel is the more demand for advertisers to display ads on the channel, this increases CPM. 39. YouTube partners are now allowed to publicly share their income. 40. There is a difference between what the advertisers pay for the ad and what revenue the content creators receive. 41. If the video supply is greater than the demand will not show any affect on each video in the channel. 42. According to Hank Green, the average CPM is $2. 43. By considering the Social Blade the estimated CPM is between $0.25 and $3.5. 44. YouTube takes 45% of the total earnings. 45. All the videos are not counted only for review but the monetized views count will be calculated. 46. 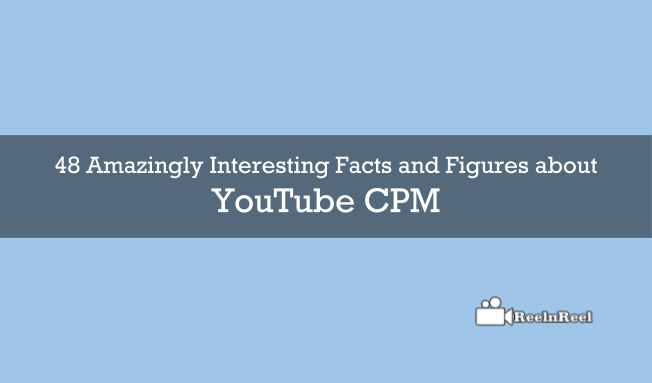 CPM is not the measurement for calculating YouTube earnings, but RPM and eCPM terms are used. 47. According to Tubemogul in 2013, the average YouTube CPM was $7.6. 48. This YouTube average is quiet dated and in these couple of years, the CPM would have also changed along with YouTube. YouTube CPM is an importent factor for YouTube paid advertising or YouTube marketing. The above article is an ultimate guide for 48 Amazingly interesting factors and figures about YouTube CPM.